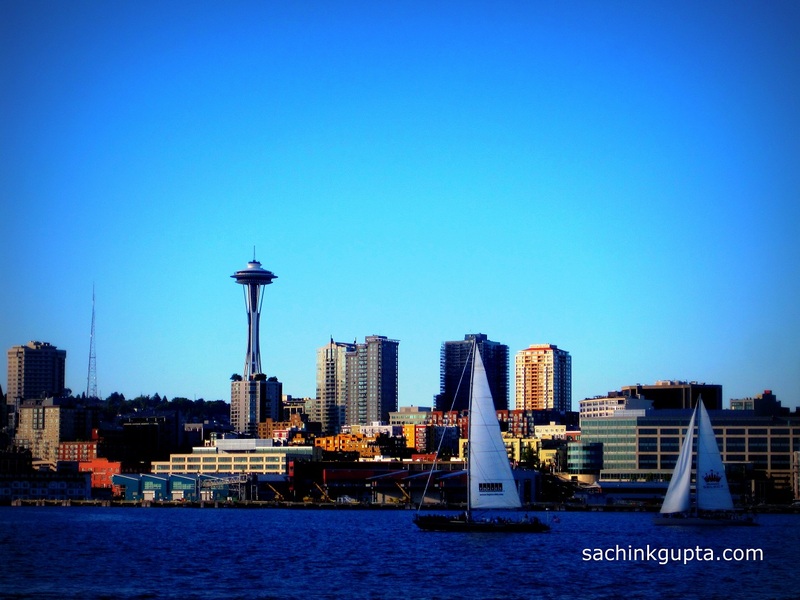 Whenever I heard the word "Seattle", the dancing lady Space Needle, the lovely symbol of Seattle comes in the memory. This beautiful lollipop-shaped icon represents motivation, love, pride, and people's innovation. I have visited Seattle three times so far, every-time this slim, three legged dancer amused me. I roamed around the places and adored the beauty of Space Needle from different part of Seattle from time to time. I have more than 500 photos of Space Needle from different angels in different seasons. Hence, the post is named as "Colors of Seattle Space Needle". During my latest visit, Space Needle celebrated its 50 years [April 1962 - 2012], that makes this post even more special. Originally it was built as a tourist attraction for city's 1962 World's Fair. The needle repainted to Galaxy gold at the top on its 50th birthday. I just enjoyed the natural views and bright emerald city lights from the top of the needle. When you are in, and up, enjoy the 360 degree observation deck. From this point, You can photoshooot the Downtown Seattle skyline with running vehicle over the streets. You can also get the glimpse of Mount Rainier, Olympic and Cascade Mountains, Mount Baker, Elliott Bay and surrounding islands. SkyCity, 360 degree revolving restaurant makes the landmark more special. This is the perfect place for dating, marriage proposal, reception, wedding of your lifetime memory. On my last visit, I toured, Tillicum village, Blake Island. This landmark was simply looking amazing during evening. The fountain place near Key Arena, is just another routine place to visit, from where you can adore the iconic beauty of Space Needle. Before this, in 2009, i.e. at my very first visit to Seattle, I was lucky to attend the Midnight fireworks celebration on the New Year's eve. This was an unforgettable experience when the fireworks were in sync with the music and rain. Lock cruise tour during the dusk along-with the Seattle skyline's panoramic view, was another opportunity for admiring this masterpiece. You be at 1st avenue, 2nd avenue or any other avenue or street in Seattle, Your eyes will kiss this icon. Approx 45 seconds to reach at the observation deck via elevators. SkyCity restaurant rotates 360 degree in approx 47 minutes. Observation deck admission fee varies person to person. All ticket prices include a free SpaceShot photograph with variety of Space Needle backgrounds. You can send this to your family and friends from the observation deck kiosk, also upload it to Facebook account. So far, The Space Needle has been appeared in many films, TV shows, art, entertainment and other works of fiction. No need to say, If you are visiting Seattle, You can't escape visiting iconic Space Needle. Nice Pics, Nice Post .. This post of yours I like the most specially the photographs seems like you collected for long then u publish those very nice photography done. Keep enjoying. Good luck. 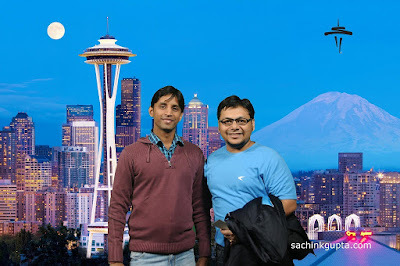 I love all your photographs of Seattle Space Needle, hope u enjoyed Seattle and places around it as well. I will love to visit this place again and again. I just love Seattle, and everything about it.